The organisation was named ahead of Pakistan activist Malala Youafzai. THE ORGANISATION FOR the Prohibition of Chemical Weapons (OPCW) has been awarded the Nobel Peace Prize for 2013. The chairman of the Norwegian Nobel Committee, Thorbjoern Jagland, made the announcement in Oslo at 10am. The chemical weapons watchdog had been mentioned among the front runners for the prize but Pakistani activist Malala Yousafzai had been the out-and-out favourite. 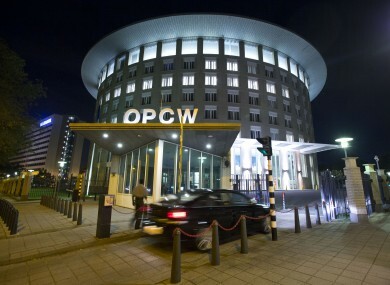 Jagland said the OPCW were chosen for its “long-standing efforts” to rid the world of chemical weapons, a mission which had its importance highlighted by recent events in Syria. He would not be drawn on reasons for choosing the watchdog ahead of Yousafzai. “Actually, the committee never comments on those who didn’t get the prize simply because we are focusing the one that has been awarded,” he told reporters. In its statement, the judging committee noted that disarmament figured prominently in Alfred Nobel’s will and that it has – through numerous prizes – underlined the need to do away with nuclear weapons. “By means of the present award to the OPCW, the committee is seeking to contribute to the elimination of chemical weapons,” it added. “During World War One, chemical weapons were used to a considerable degree. The Geneva Convention of 1925 prohibited the use, but not the production or storage, of chemical weapons,” explained Jagland. “During World War Two, chemical means were employed in Hitler’s mass exterminations. During this morning’s press conference, the chairman also called on those states who are still not signed up to the OPCW convention to do so. He also called out the US and Russia for not observing the April 2012 deadline for destroying their arsenals. Email “OPCW wins Nobel Peace Prize for work in eliminating chemical weapons”. Feedback on “OPCW wins Nobel Peace Prize for work in eliminating chemical weapons”.